Terse, succinct, almost clipped in style, Manchette’s prose walks out across the pages like the swift, almost automatic methods and mannerisms of his protagonist. Manchette opens this 1981 novel with his Frenchman in an English rural setting, the ancient city of Worcester and its surrounding countryside. Terrier, the assassin, waits patiently in an old Bedford van. He carries an Ortgies automatic handgun with a Redfield silencer. He smokes Gauloises. We imagine he looks unremarkable, not because he is, but because this is the way he wants to look. Like no one. A face you see, and then forget. His mark, a certain Marshal Dubofsky, appears from a house. The mark kisses his wife and hurries to catch a bus. Terrier follows in the Bedford. The mark alights the bus in the center of Worcester. He enters a cinema where they are showing an unremarkable thriller starring Charles Bronson, also a regional black-and-white comedy with Diane Cilento. Terrier waits again until a third character--“a fake redhead dressed in a poppy-red-three-quarter-length coat of acrylic fur, wearing scarlet lipstick, too much mascara, and black plastic boots with very high heels”--exits the cinema and starts to walk. Dubofsky also exits and quickly follows her. We anticipate a rendezvous, a meeting between Dubofsky, a married man, and this woman. Terrier follows them in the van. He overtakes. He exits the vehicle. Dubofsky almost walks into him. What then happens establishes the clean, uncomplicated, pragmatic, and unemotional attitude that Terrier applies to all his work assignments. What happens then does not need to be detailed here. And so we meet Manchette’s “Terrier.” Did Manchette choose as such to convey the insistent, aggressive, unrelenting nature of the breed of dog after which his hero is named? Did he begin this book with a view that here he would present us with the most clinical and methodical individual he could imagine, yet engaged in “work” that would ordinarily provoke the most alarming of mental and emotional reactions in any normal human being? Is Terrier deranged, psychotic, homophobic? Who is this man, and why is he this way? How can he do such things with such composed equanimity? Apparently sangfroid and imperturbable, Terrier continues to alarm and unnerve with his utter lack of emotional connection. I cannot help but read this work and think of Frederick Forsyth’s “Jackal,” a man we never get to grips with in any depth. Perhaps here Manchette has given us the back story of all such men, a brief glimpse of the internal world of such characters: men beyond the emotional horizon, men who can not and do not operate within any frame of reference or context that we can seriously comprehend. Yet this is no catalogue of horrors. Despite the fact that Manchette walks us through the awkward, unreasoning, unquestioning life of Martin Terrier; although he gives us ringside seats to the strange circus that is the existence of this cold-hearted and unremittingly bleak killer, Manchette also gives us a window into the soul of an ultimately broken man. The circular nature of this short and powerful novel, the fact that two relationships--first and foremost, Terrier’s relationship with his own father, and then, perhaps no less important, Terrier’s “ten-year plan” to secure the love of a woman--lie at the very center of this brutal piece, show us that Manchette, a brilliant stylist and wordsmith, was not simply trying to shock, but was also trying to understand, explain, perhaps even rationalize the raison d’être of this vicious little dog of a man, Martin Terrier. The nom de guerre assumed by Terrier for his assignments--Christian--is also ultimately French, perhaps Manchette’s desire to present us with the dichotomies and contradictions that drive such an individual to be who he is, and to do what he does. The methods of self-justification employed by Terrier and his colleagues, the fact that they approach all they do so systematically, the questions that are raised as to the identity of the organization to which these people belong, who they work for, whether they are government-sanctioned or private ... these are all opened, but never fully closed. We never really understand the whys and wherefores, and Manchette--I believe--never intended us to. Manchette stated that the crime novel was “the great moral literature of our time,” and I concur. Crime, as a genre, encompasses all: romance, politics, culture, social commentary, psychology, history, ethics, morals, philosophy, religion. All subjects and concerns are found addressed in crime fiction. I heard only a week ago that if one cared to look at the hundred most popular classics of the last two centuries, how many of them--strictly speaking--were crime novels? A great deal, the speaker said, and I could do nothing but agree. Jean-Patrick Manchette died young, only 52 when he passed away in Paris. Born in Marseilles in 1942, he was credited with reinventing and reinvigorating the crime-fiction genre in France. He did not write Maigret. He did not write banal and predictable police procedurals. His stories are violent, existential essays on the human condition, more visceral than cerebral. They are American noir transposed into a harsh, cool, French reality. 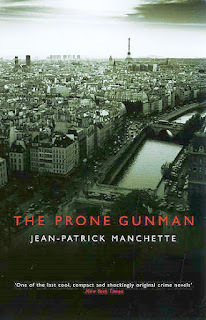 Three to Kill (translated into English, originally published as Le Petit Bleu de la Côte Ouest) and this volume, The Prone Gunman (published in French as La Position du Tireur Couché) are currently available, and New York Review Books Classics has scheduled the release of a third, Fatale, in 2011. Manchette left us with a punishing look into a brutal world. It is not easy reading, but then we do not read crime fiction to be transported into some comforting reality. We read crime fiction for a thousand different reasons, all as valid as one another, but none more important than the need to experience by proxy those lives that we otherwise never could. Terrier’s is a cruel life, and that cruelty he delivers to others in equal measure. A window is opened into his world, and through that window we see what he is. It is not a pleasant view. It is dark and unforgiving. And what becomes of Terrier? Well, it has been said that ultimately one becomes that which one fears the most. Justice, in a strange trick of irony, awaits him, and--as with all things he undertakes--he methodically and systematically meets his schedule. I'd say read 3-to-Kill over The Prone Gunman. I agree with Guy. THREE TO KILL is a better book. It's certainly more consistent in tone and confident in execution. I read THE PRONE GUNMAN a few weeks ago. It is a frustrating book. It starts off great, with some of the leanest, meanest prose you'll ever find in a noir... taking the familiar "hitman on his last job" scenario and making it seem fresh. I fell in love with the prose and the world-view. The hitman, Martin Terrier, is an odd, interesting character...hardly the smooth, self-assured, perfect killer. He's quite possibly nuts. And all of that is wonderful, especially when he returns to his hometown to reclaim his old love. But then, after a short time, the story shifts into a break-neck, almost ridiculous action-adventure, and even that is a lot of fun, before ultimately devolving, inexplicably and disappointingly, into outright farce. It's a shame, because so much of the book works so well. It's as if Manchette lost faith his story, or got tired of what he was doing, and decided that his efforts were worthy only of ridicule, but finished it anyway, using his last few pages to insult himself. The book reminded me of THE FOUR CHAMBERED VILLAIN, an obscure novel and also uneven novel about hitman that's played perfectly straight, and also of THE EIGER SANCTION by Trevanian, which was *meant* to be farce but, to the author's dismay, was taken seriously as thriller (as I wrote in my chapter of 100 Must Read Thrillers). At least EIGER was consistent in its tone, PRONE GUNMAN is not. But it was intriguing enough for me to read THREE TO KILL immediately afterwards.